There are several good options for Mortgage Brokers in Oshawa, however very few can provide the best of mortgage rate, product and service. Our revolutionary mortgage platform and award-winning team ensure that you only get the very best. Importantly, there is no cost to use our services, for the vast majority of our clients, and there is no obligation during the pre-approval process. We are confident that you will want to move forward, so we dedicate a complimentary phone consultation to answer your questions, simply and effectively, and show you the real difference first hand. Oshawa has a metro population just north of 400,000 people as of 2018, and sits on the shores of Lake Ontario, about 60 km east of downtown Toronto. Oshawa is known across the GTA for its GM assembly facility and in Ontario as one of the automotive capitals of Canada, along with site its friendly rival in Windsor Ontario. 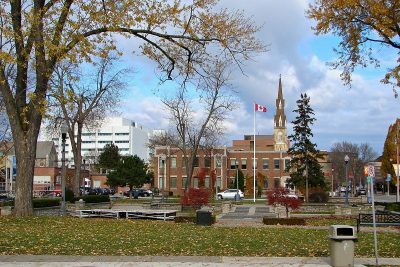 But less known is the concentration of Government buildings in downtown Oshawa, particularly the revenue collection arm of the Ontario Government. There is a mix of white collar and blue collar workers in Oshawa, but all have come to enjoy the lowest mortgage rates from top mortgage brokers in the area. Locals are encouraged to contact a mortgage broker to keep their home costs as low as possible, while benefiting from the stable housing environment in the area. In 2018, the Oshawa housing market stabilized in the wake of the mortgage stress test that was introduced. Although local property listings are down, the market itself is showing substantial resiliency. The neighborhoods of the City offered tremendous value over the past few years, and as a result, some of the highest growth rats in prices were found in Oshawa. Also, many areas of the City saw houses revitalized as they were bought by homeowners looking for a lower cost solution than could be found directly in Toronto. Its typically not a house that costs money – houses tend to increase in value over time and are therefore a growth investment. However, mortgage interest will only ever cost money, which is why Altrua encourages Oshawa locals to connect with a great mortgage broker as they buy or renew their mortgage.